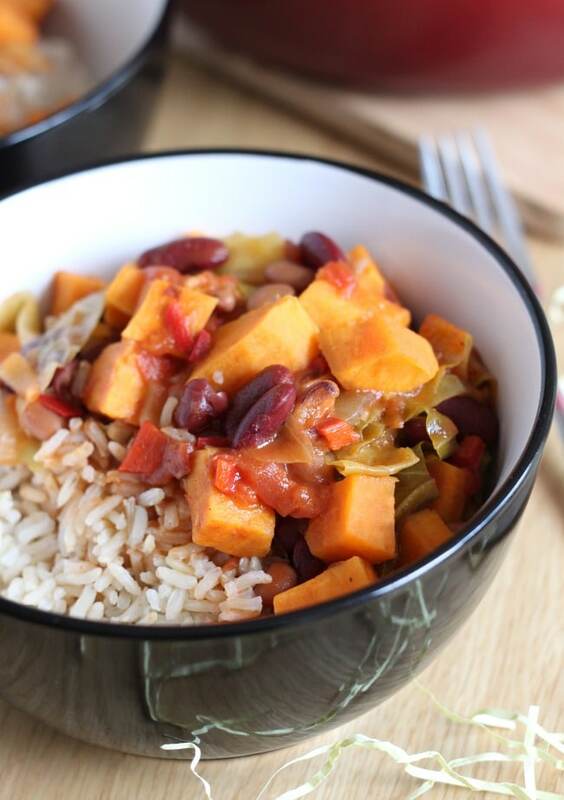 To celebrate Caribbean Food Week, I had a go at making a Caribbean-style recipe. A lot of Caribbean food is meat-based (and sometimes quite unusual meats, at that), but there are vegetarian options too. 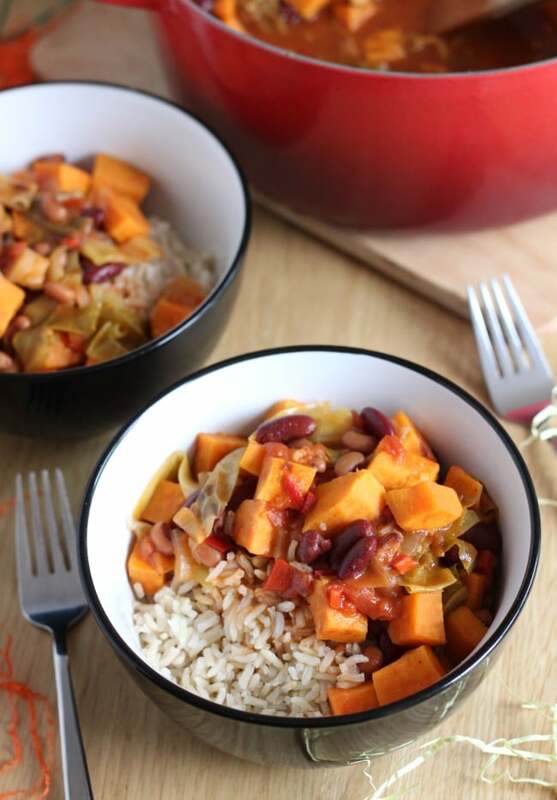 Next on my list are vegetarian Jamaican patties, but this time I thought I’d keep it simple with this sweet potato stew with blackeye beans. It’s rich and flavourful, and definitely makes me wish I was in the Caribbean! I’ve travelled to some amazing places in the last ten years or so, but unfortunately none of them have been in the Caribbean – so I can’t vouch for the authenticity of this stew. But if, like me, you’d like to do your bit to celebrate Caribbean food this week, I think this fits the bill pretty nicely. 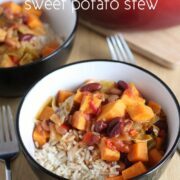 The flavours in this stew are incredible – I’m loving the sweet / spicy combination lately! A lot of the flavour comes from the BBQ sauce, so make sure you choose a good one! 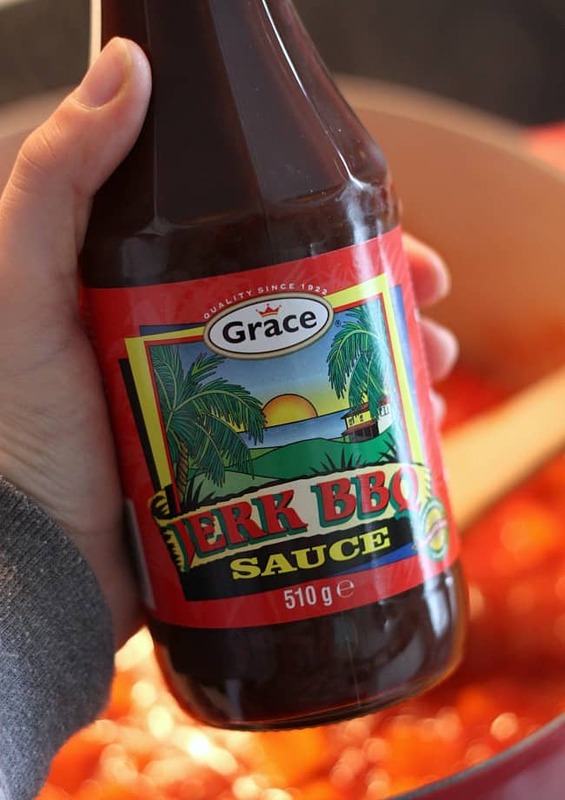 I used this Jerk BBQ sauce, which added to the Caribbean vibe perfectly – it’s got just the right amount of sweetness and smokiness to flavour the stew without overpowering it. But, there are plenty of other great flavours in this sweet potato stew, it’s not only the BBQ sauce. 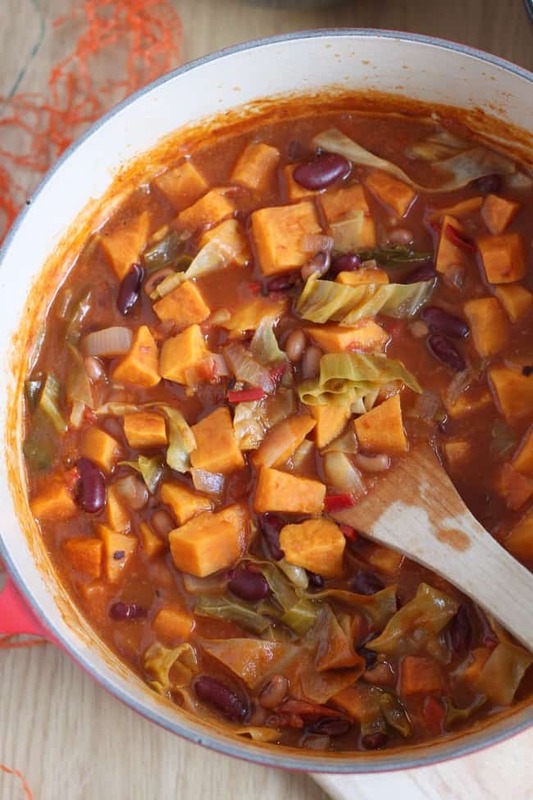 The chunks of sweet potato, kidney beans, black eyed beans and cabbage are also flavoured with tomatoes, coconut milk, spring onions, garlic, red chillis and veggie stock. It all adds up to a great stew! 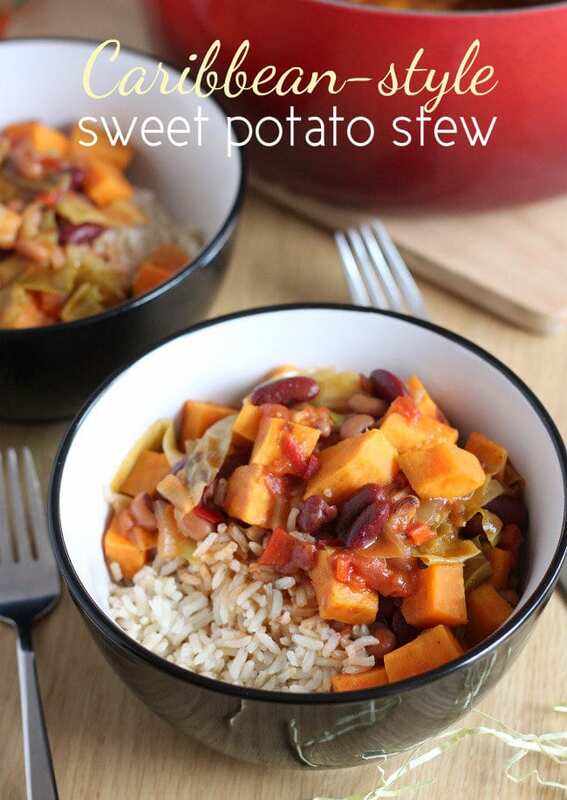 This recipe makes a massive batch of sweet potato stew – I reckon it’ll feed at least 8. So it’s perfect for a big family gathering – leave it bubbling away and serve it up whenever everybody’s ready (my favourite thing about stew recipes – so low-maintenance!). If your family is smaller than that (like my itty bitty family of two), you could try freezing the leftovers, which is what I will be doing – I’ll report back! I’m even thinking of repurposing a bit of it into some sort of Caribbean-style enchiladas, what do you reckon? 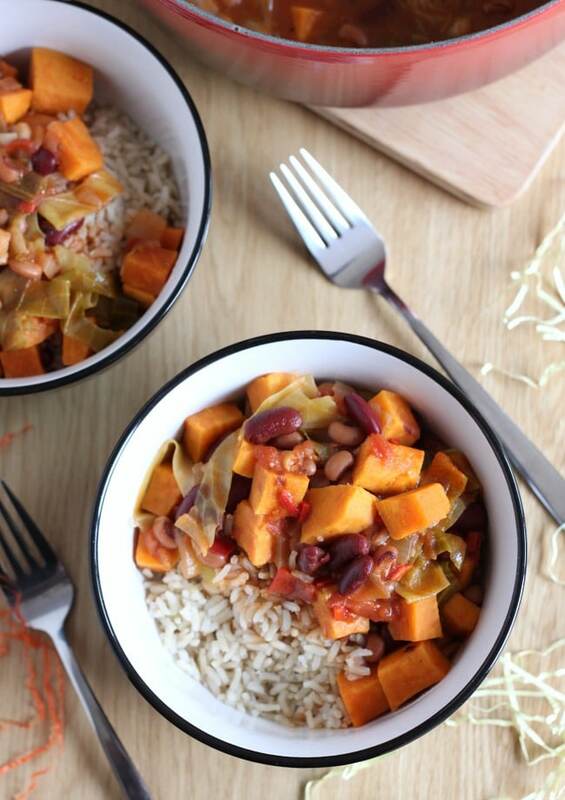 Do you think you’ll be making anything special this week to celebrate Caribbean Food Week? Or are you going to the Notting Hill Carnival? Keep an eye out in your local shops for any Caribbean-themed samples or promotional offers! Heat the oil in a large casserole dish, and add the chopped onion, spring onions, garlic, red chillis, and diced sweet potato. Cook everything over a medium heat for 5 minutes, stirring regularly, until the onion is almost soft. Pour in the chopped tomatoes, vegetable stock and BBQ sauce, mix well, and cover with a lid. Leave to simmer gently for 10 minutes. 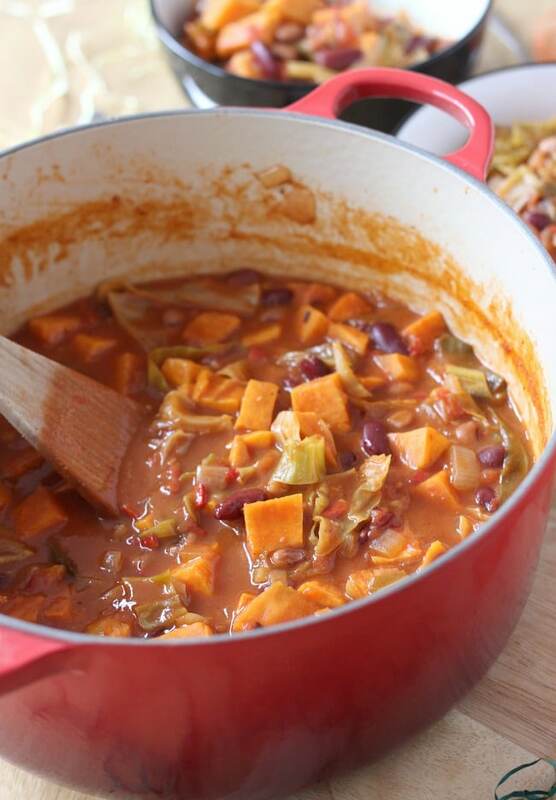 Add the chopped cabbage and the two tins of beans, as well as the coconut milk. Cover again, and simmer for a further 10 minutes. When the sweet potato is fully cooked and everything is piping hot, season to taste, and serve with brown rice. 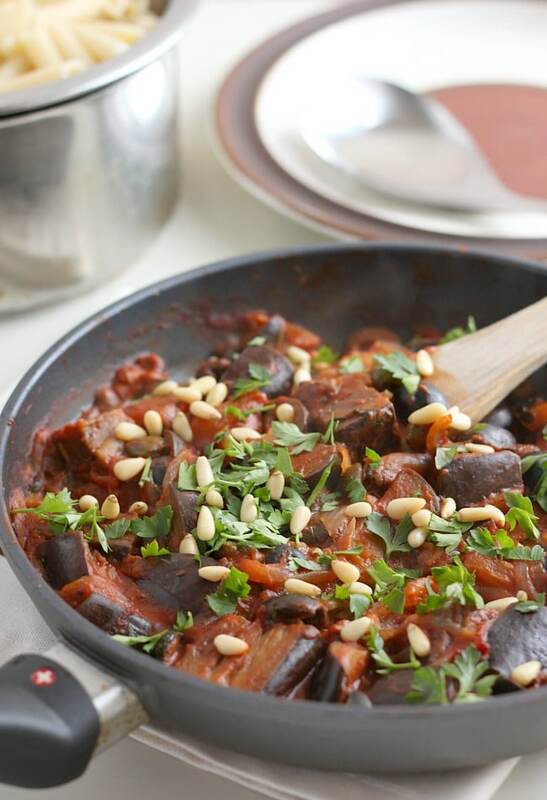 Here’s another easy vegan stew recipe: aubergine stew with olives and capers! Sooo good! I forgot to buy chillis and definitely missed that heat. I used collards instead of cabbage. It was my first time using coconut milk. I will make this again. Thanks! Such a pity about the weather at this year’s carnival. But your dish would have brightened things up considerably Becca. This sounds incredible! I have a huge surplus of sweet potatoes and can’t wait to give this a go! This looks perfect to celebrate the last of the cold weather we’re having in Oz. I’ve only just discovered Jamacian food so I’ll have to give this a try. My mouth is simply watering!! I can almost taste the different flavors coming through. I simply love hot and spicy food and this certainly would fit the bill. I will certainly make this recipe — thank you. 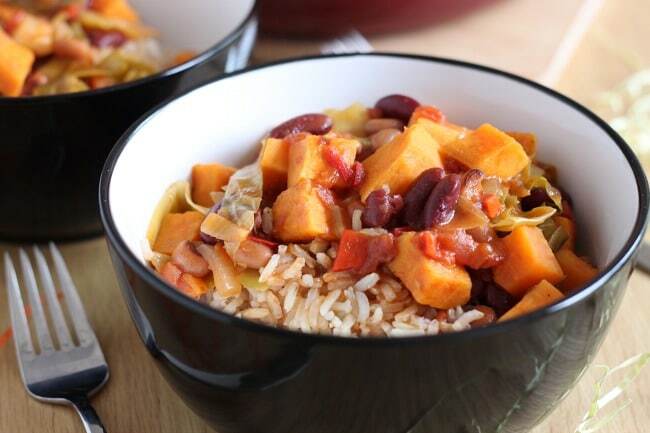 I don’t think that I have ever cooked anything caribbean before, but I do love spicy food so this is definitely going on my to make list, thank you for the recipe. i live ooop north so no chance of going to the Notting Hill Festival – I have seen it on the TV and it looks amazing, the costumes are out of this world. I’d not made much Caribbean food before but the flavours were amazing, I think it might be a new favourite!